Usually, when asked about the Gili Islands, we instantly think about the famous trio in the north-west corner of Lombok. Yes, I’m talking about Trawangan, Meno, and Air. However, those aren’t the only Gilis in the area. In the south-western corner, you’ll find Gili Nanggu, Sudak, Gede, and other exceptional islands with a different atmosphere. Ok, but what about the eastern wing? Today I want to introduce you all to Gili Sunut, an amazing island that “hides” in East Lombok Regency and offers a different vibe for the tourists. Take a look at the map: our destination is “hiding” in the lower right corner and doesn’t look much. Don’t let the tiny dimensions fool you, though. There’s enough to see and to do in Sunut. You can get there on a boat, and there are enough places in the area where you can rent one for cheap. The coastline is truly gorgeous, and I highly encourage the foreigners to take advantage of the tours where the local fishermen take you for a spin. That gives us a chance to admire Lombok from afar and discover other tiny Gilis that aren’t even on the map. As always, everything is cheap, and if you’re traveling with children, I promise this “oceanic journey” will become the highlight of their stay on the island. And don’t forget to take pictures while you’re at it! 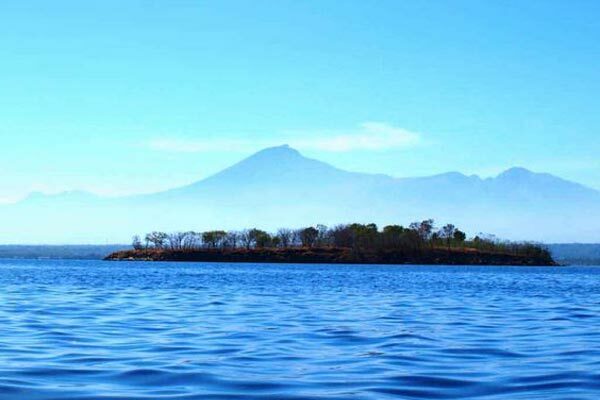 What Is Gili Sunut All About? I don’t even have to tell you that Gili Sunut is a beautiful island because there aren’t any “ugly” ones in Indonesia. The white sand feels great under one’s feet and the entire place looks like a resort. The views are mesmerizing, perfect for taking some amazing photos (with the ocean serving as background). The locals claim that they can cross the ocean and get from Lombok to Sunut. The tides were strong when I was there and never had a chance to test that crazy theory. But I’ll tell you more about it later. Back in the day, it was full of people; these days, it’s half-empty and you’ll feel like the one and only living-breathing creature once you step foot there. If that’s exactly what you need from the next trip, then Gili Sunut will be the right pick. If not, well, the lonely atmosphere will require some getting used to. Make sure to plan your trip during the high season, when the grass is green and the trees are lush. At the same time, I gotta say that even during the dry season, this place looks lovely (as opposed to most of Lombok). The ocean is warm, but, again, it would be best to pick a date during the hot months; otherwise, it might be chilly and uncomfortable for a dip. Swimming and snorkeling are one of the most popular activities in Lombok, and it would be a pity to miss your chance to enjoy the underwater life of East Lombok Regency. According to the government officials, Gili Sunut is popular among the tourists because of the world-famous Pink Beach. Make sure to check out my full review, but for now, let me just tell you that these two spots are minutes away from each other and you definitely should visit both. The beach might not be as pink/red as promised, but it certainly is an interesting landmark. Remember I mentioned the boat tours? Well, they’ll probably take you to the three islands right above the Pink Beach – Gili Temeak, Petelu, and Pulau Tiga. Compared to Gili Sunut, they are incredibly tiny; yet, for a change of scenery and new experiences, they are just what the doc ordered. As mentioned earlier, this island used to be inhabited, but the community moved to Lombok because there wasn’t much left in Sunut. That means the tourists and some local kids are the only ones that visit it these days. When I got there with my friends, I met a group of local students that were after the same thing as we were: solitude. We ended up becoming friends and learning a lot about each other’s cultures. Sekaroh, District Jerowaru is a magical place. And you can get there not only from the Pink Beach but also from Tanjung Luar. The boat rides from there might be a bit more expensive but well worth it, since you’ll get to see more of Lombok. A Boring Place Or A Perfect Getaway Island? One of the best things about Gili Sunut is the fact that there isn’t any trash lying around. Indonesia is famous for the piles of rubbish; that doesn’t apply here. During the dry season, the ocean might be full of yellow leaves, but they actually look cool. For sunbathing, swimming, and snorkeling, that doesn’t create any problems whatsoever. Hey, that’s not even the half of it: the most amazing “feature” of Sunut is the desert-like surface. Most of it is covered in weeds, and when the dry season arrives, they change their color to brown. The scenery makes you feel like it’s an African desert, not an island in South Asia. Don’t worry: there are enough beautiful trees there as well, and they look equally stunning with and without their green leaves. Gili Sunut is an ideal spot for birthdays, anniversaries, weddings, and other big-time celebrations. That actually applies to most Gilis. Here comes the sad part: there aren’t any restaurants, warungs, or even food stalls on this island. Same goes for the hotels/guest houses/berugaks. With that said, make sure to pack the bag with enough food, drinks, dry clothes, sun cream, mosquito repellent, and everything else in between. Or, if you’re not planning on swimming and just want to spend a couple of hours there, the bag can be half-empty. It might be a good idea to get yourself full with food right before you hop on a boat. That will keep you satisfied for at least a couple of hours. It all depends on how long you want to stay in Gili Sunut. And please, don’t leave any plastic bags behind. Be a conscious tourist, don’t desecrate this heavenly island. When talking to the boat owners, don’t try to act like a “macho”, because most of them are old fellas with tons of experience behind their backs. They will “read” you way before you notice them. True, they aren’t always 100% honest and will try to increase the price for renting their boats. Only a local friend of yours might be able to help you keep the price down. Thankfully, everything is incredibly cheap compared to the Western countries and you’ll still be surprised by how little they charge even with the additional fees. The waves are rarely taller than 0, 5 meters, which makes Gili Sunut a perfect place for playing with the kids. The fish aren’t afraid to “hang out” near the beaches, as they rarely if ever see any humans there. There’s a hill in the middle, and for the best seats in the house, you’ll have to do some climbing. The sad part is – Sunut is not nearly as popular as Gili T; the happy part is – the loners will get to enjoy it to the fullest without the crowd interfering. Unfortunately, surfing is not available, as the tides are very slow and weak. I know I said that the tourists can get to Gili Sunut on boats, and that’s still true. However, most of us will probably hire a taxi at the Lombok International Airport and head straight to our destination. I did say that during the “calm” season, it is possible to cross the distance between Lombok’s shore and the island, right? If not, well, then the locals will help you with their boats. The key here is to get there early in the morning when the tides are low. In the evening, they get higher and make it impossible to “walk on “water”, so to speak. The ride from the airport will take approximately 2 hours. The shortest route is pretty straightforward. The longer route lies across the southern coast of Lombok and will introduce you to some beautiful beaches (like Kuta, for example) and villages. The long route is +/- 20 kilometers longer but is well worth it. From Mataram, the capital, the road will take 2 hours and 30 minutes, no matter which route you take. Given the fact that Gili Sunut is located in the farthest corner of the big island, you won’t be spending that much time driving there. This isn't the most fun Gili, to be honest. For me, at least. But it is beautiful, no doubt there. The boat trips in East Lombok are fascinating. I actually managed to "outline" Lombok from all sides on a boat! The sunsets are beautiful; the climate is lovely; the trees look equally great during both the dry and the wet seasons. Even when the tides are high, you can still struggle through it all. That's what my local friend told me. Gili Sunut allows the tourists to enjoy the scenery without tons of people overcrowding the place.